Mayor Caldwell leads today?? ?s press conference at corner of Kalākaua and Kapahulu avenues. 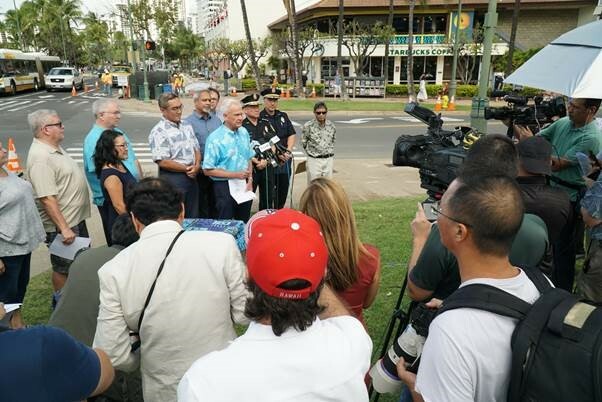 Waikīkī – Today, Mayor Kirk Caldwell was joined by officials from the Honolulu Police Department, the Hawai‘i Tourism Authority (HTA), the Waikīkī Business Improvement District Association (WBIDA), and various city agencies, to unveil a new public safety package aimed at improving security in Waikīkī. •In addition to the existing cameras, at least 40 new cameras will be installed in the coming months. •Monitoring of the new cameras will still take place at the Waikīkī police substation, with assistance from the Aloha Ambassadors funded by the WBIDA. In 2018 O‘ahu welcomed 5.93 million visitors, and this level of enthusiasm for a vacation in the City and County of Honolulu is expected to increase or remain steady in coming years. In 2017, Federal Bureau of Investigation (FBI) statistics showed Hawai‘i had the lowest crime rate since records began in 1975, a 42-year low. Due to a number of recent high-profile incidents in Waikīkī, the city met with multiple agencies from the public and private sector, resulting in the formation of Mayor Caldwell’s new public safety package.